A sinus infection, also known as sinusitis or rhinosinusitis, can occur when the sinus cavities become inflamed or irritated. This inflammation can inhibit the sinuses from draining, causing mucus to build up in the nasal passages. 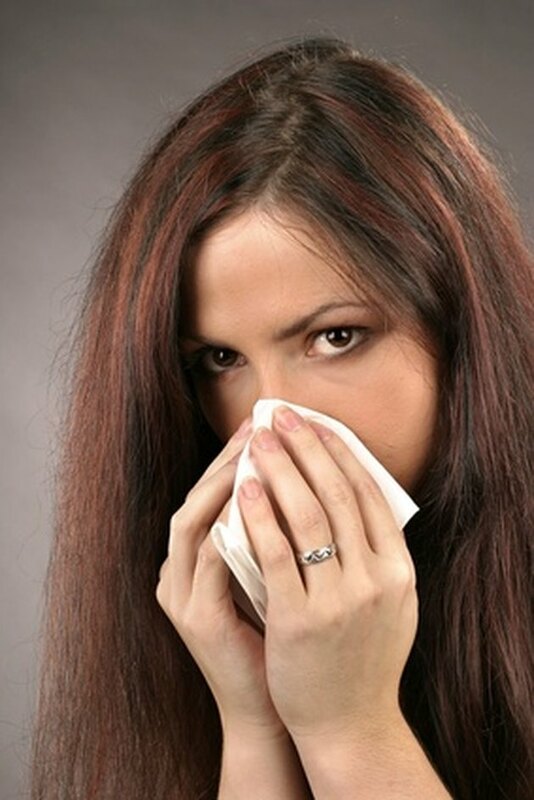 Sinus congestion is uncomfortable and can cause you to have difficulty breathing. Additionally, the eyes and area around your eyes and nose may be swollen or you may experience headaches. Although there is no specific cure, here are some treatment options to dry out a sinus and relieve related symptoms. Take an over-the-counter decongestant such as Sudafed to help unblock nasal passages and promote fluid drainage. Use an over-the-counter nasal corticosteroid such as Nasonex or Flonase to reduce inflammation and help to clear nasal passages. Use steam to promote drainage. Drape a towel over your head while inhaling steam from hot water in a bowl. Consider adding peppermint or eucalyptus oil to the water as a form of aromatherapy. Taking a hot shower can have similar results. Place warm compresses on your face to loosen mucous and help nasal passages drain. Place clean towels in a large bowl of warm water. Squeeze out excess water and place the towels on your face. Let sit until the towel cools. Repeat if desired. Perform nasal lavage. Nasal lavage is the process of draining the nasal passages. Fluid is passed through the nasal passage by inserting it into each nostril. As the water drains out, it should dilute mucous and rinse out your passages or allow you to clear your passages by blowing your nose. Use an over-the-counter product such as Sinus Rinse or a neti pot. Some products come with a saline solution, but plain warm water can be just as effective. Drink ample fluids (at least 64 oz.) such as water or natural juice. Drinking fluids dilutes mucous and promotes drainage. Avoid caffeine or alcohol because they can cause dehydration and can cause the nasal passages to restrict further. Contrary to popular belief, the key to drying out sinuses is increasing moisture to promote drainage. Take an over-the-counter pain reliever such as Motrin, Tylenol or Aleve to alleviate any pain in the head or facial area. Sleep with your head elevated to decrease congestion and increase the angle to promote drainage. Using a nasal saline spray can be helpful to keep the nasal passages moistened. If your symptoms persist and don't seem to be responding to treatment, let your doctor know immediately.